There are 6 monuments in Lack. One Children’s Burial Ground, 1 Ringfort (rath), 1 Souterrain, 1 Country house, 1 designed landscape (tree-ring) and 1 Mill (unclassified). 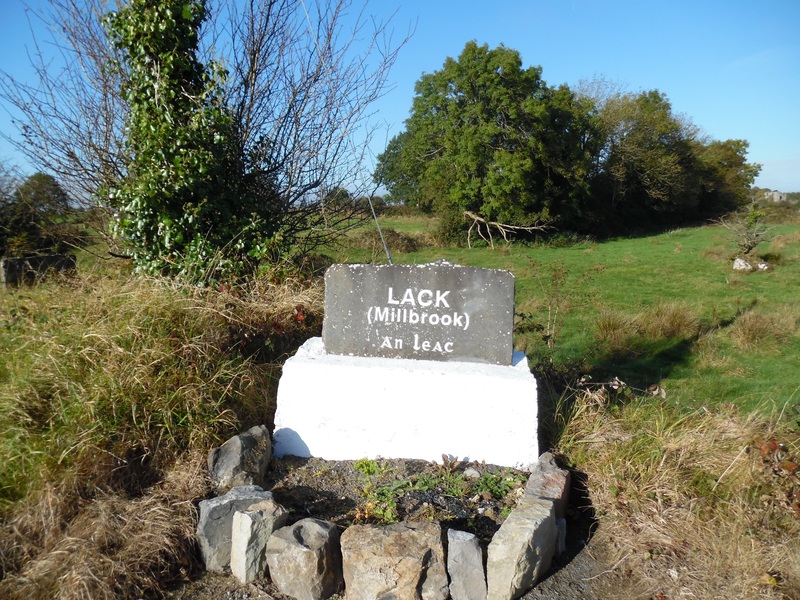 The first monument is a Children’s Burial Ground which lies on a slight natural platform, approximately 50 meters west of the Clare River which marks the townland boundary. A rectangular area (North-South 14 meters, East-West 7 meters) enclosed by a low mortared stone wall. The interior is almost entirely covered with small set stones. Near the center, a few narrow slabs apparently cover entire graves. The second monument is a ringfort (rath), which lies on a rise in otherwise level grassland. The river Clare flows to south of the Subcircular ringfort (northwest-southeast 38m), in fair condition, defined by two banks and an intervening fosse. The inner bank is faced with stone. A field bank overlies the fosse and outer bank from north-northwest through north to southeast. The third monument is a Souterrain (from French ‘sous terrain’, meaning ‘under-ground’), lies within and adjoining the bank of a ringfort (GA016-090—). A fairly well preserved drystone-built souterrain, dog-legged in plan, consisting of two chambers connected by a creep. The 1st chamber (length 2.6m, width 1,1m) runs east-west. Access gained via an opening and the east end. A rectangular depression extending to east of this, with evidence of drystone walling and a possible roof lintel, suggests the chamber extended a further 5m in this direction. The creep (width 0.65m) at southwest end is inaccessible but leads to the 2nd chamber (length c. 12m) which runs northeast-southwest. A possible air vent (diameter 0.15m), indicated by a stone lined opening, and is visible on the outer face of the inner bank of the rath. The fourth monument is a Mill (unclassified), there are no descriptive details for this building at present. The fifth monument is a country house, there are no descriptive details for this building at present. The sixth monument is a designed landscape; there are no descriptive details for this record at present.